For many artists, recording their debut album is a labour of love, that can take not just months, but years of their lives. This time is spent in a recording studio, and sometimes, in their home, where they continue to work on their debut album in their spare time. Initially, artists are full of enthusiasm, and believe that the album that they’re recording will not only transform their career. Especially for many unsigned artists, who hope that the album they’re recording will see them signed to a record company and a new chapter in their career unfolding. Sometimes, though, the project consumes them, and takes over their life, leaving little time for family and friends. By then, an artist can have spent a year or two, working on their debut album, and feel that they’ve invested too much of their life and sometimes, finances on the project to walk away from it. While walking from a project may not be an option, taking time out can allow an artist to rethink what they’re doing and return refreshed and reinvigorated. Nowadays, many artists will spend several years on an album, and will regularly take time out, before returning to the project at a later. Especially artists who are working on several projects at the same time. They’re often unable to dedicate a year of their life to writing and recording an album, and it’s been known for an artist to take four years to record their debut album. That was the case with Swedish musician, singer, songwriter and producer John Roger Olsson, who spent four years on and off, recording Havenaire’s debut album Tremolo. In 2011, Stockholm based John Roger Olsson began working on Tremelo which was the debut album from his latest musical vehicle, Havenaire. By then, John Roger Olsson was a familiar face on the Swedish music scene since 2001. During that ten-year period, he had worked as musician, singer, songwriter and producer. With his skills in demand, he would need to work on Tremelo when time permitted. John Roger Olsson knew he couldn’t dedicate a year of his life to writing and recording Havenaire’s debut album Tremolo. It wouldn’t have made financial sense, and even if he had been able to spend a year recording Tremelo, by the time he was finished would he still be in demand as a musician, singer, songwriter and producer? There were plenty of up-and-coming musicians in Sweden, and elsewhere in Scandinavia. With that in mind, John Roger Olsson continued to work career as a musician, songwriter and producer over the next four years, when time permitted, he recorded the eight tracks at Möre Studio and at his Stockholm home between 2011 and 2015. After four long years eventually, Havenaire’s debut album Tremolo was completed. It was a proud moment for John Roger Olsson, and now he had to find a record company willing to release Tremelo. Eventually, Constellation Tatsu, an American label based in Oakland, agreed to release Havenaire’s debut album Tremolo. Constellation Tatsu were won over by Tremolo’s minimalist sound where Havenaire fuse elements of ambient, drone and electronica and agreed to release Tremelo. The release of Havenaire’s debut album Tremolo was scheduled by Constellation Tatsu for release on cassette on February the ’23rd’ 2016, some five years after work began on the project. Seeing Tremolo released was another proud moment for John Roger Olsson. Now there was a small matter of Havenaire’s sophomore album. Many people who knew John Roger Olsson were well aware that he had taken five to complete Tremelo, and doubtless, when the subject of the followup came up, joked that they would see him in 2021. They probably thought that it would another five years before Havenaire’s sophomore album was ready for release. This took the pressure off John Roger Olsson, who completed returned in December 2017 with his eagerly awaited sophomore album Rabot which was released by the Glacial Movements label. This is the perfect label for Havenaire. The Glacial Movements label is an Italian label founded and curated by Alessandro Tedeschi. Glacial Movements specialised in ambient and electronic arctic soundscapes, which is the perfect description of Havenaire’s sophomore album Rabot. It was sculpted by John Roger Olsson’s beloved analog synths which are now his musical palette. This is changed days indeed, as John Roger Olsson was previously a guitarist and drummer. He’s best remembered as a member of The Grand Opening, whose speciality was wistful indie pop. That is in the past, and now that John Roger Olsson has dawned the Havenaire moniker he spends his time sculpting ethereal and glacial arctic soundscapes like those on Rabot. There’s a total of six soundscapes on Rabot, which John Roger Olsson sculpted over a number of months. His inspiration for the music was a series of old photos taken by Swedish geographer Fredrik Enquist in 1910. These photographs inspired Havenaire’s six soundscapes that feature on Rabot. The carefully sculpted ambient soundscapes on Rabot are best described as ethereal, glacial and cinematic as they conjure up pictures of a frozen wasteland that is both bleak and beautiful. Especially on Rabot, before Enquist Photo 1910 introduces a degree of darkness and drama. Maybe this is Havenaire’s way of warning that this beautiful landscape can sometimes be a perilous place? That drama returns Sylarna which has an elegiac and melancholy sound as washes of cinematic synths paint pictures that transport the listener back in time to 1910 and the bleak and beautiful landscape that Fredrik Enquist photographed over a hundred years ago. Again, there’s a degree of drama on Calving where shimmering, glistening synths combine with a jittering drone before a much more hopeful, and beautiful sound emerges. Maybe it’s because the seasons are changing, and spring has arrived, which is the time for Calving? 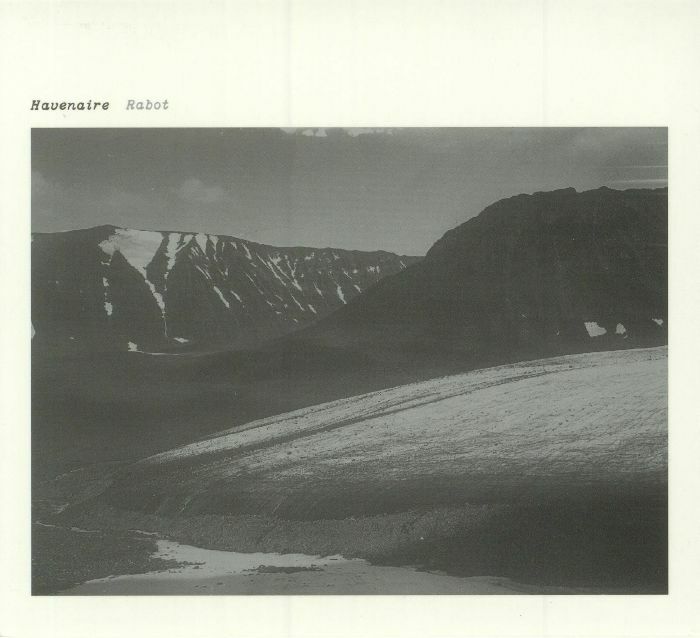 The photograph on Rabot’s album cover to Rabot suggests that, and Havenaire paints a picture of a different landscape emerging as it sheds its winter coat. Closing Rabot is Sarek Pt. 1 and 2, an eleven minute opus, where ethereal, dreamy synths are responsible for a slow, minimalist soundscape that floats along. The music is graceful, but sometimes becomes dark and elegiac as if reminding the listener that the terrain is treacherous. Fredrik Enquist photograph on Rabot’s album cover is reminder of that. However, later, there’s hope and ethereal beauty on what’s one of Havenaire’s finest moments on Rabot. It closes Rabot on a high. For all those people yet to discover the delights of Havenaire’s ambient arctic soundscapes then Rabot is the perfect introduction to his music. Rabot was released on the Glacial Movements label, which specialises in releasing albums of electronic arctic soundscapes. That is without doubt, the perfect description of the music Havenaire’s recently released sophomore album Rabot. John Roger Olsson a.k.a. Havenaire composed, recorded and produced the six soundscapes on Rabot, which are a fusion of ambient, avant-garde, drone and electronica. While it took Havenaire five years on and off to record his debut album Tremelo, this time around, Havenaire was able to complete his sophomore album Rabot much quicker. The result is an album where Havenaire manages to surpass the quality of music on Tremelo. Using an array of analog synths, which are the equivalent to his musical palette, he sculpted and honed the music on Rabot. The result is one of the finest albums of ambient music released during 2017. That is no surprise as Rabot’s cinematic sound is rich in imagery, as Havenaire’s music transports the listener to the terrain that Swedish geographer Fredrik Enquist photographed in 1910. 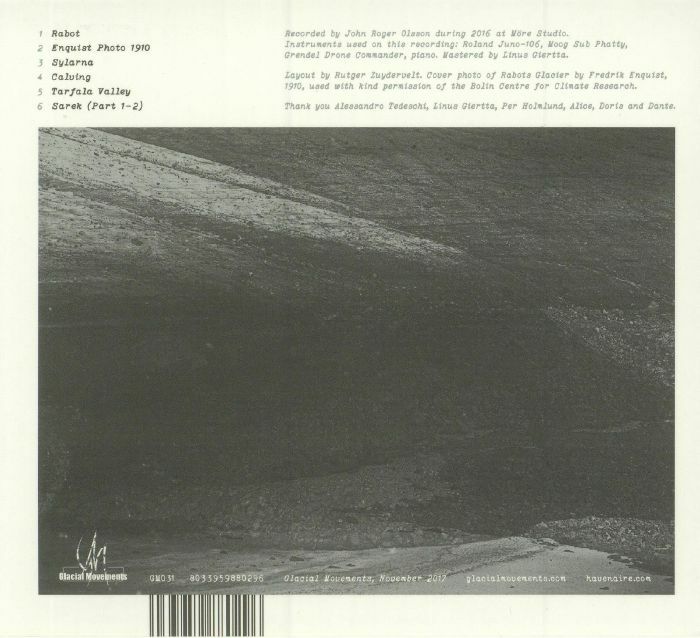 One of his photographs featured on Rabot’s album cover, while another on back of the album. Both photos are proof that a picture can say more than a thousand words. So can Rabot, which is the musical equivalent to time travel, with Havenaire taking the listener back to 1910 and the land where Fredrik Enquist visited and photographed. Suddenly the listener is standing alongside Fredrik Enquist and seeing the terrain as he sees it. This is only possible because of the music on Rabot, which is Havenaire’s stunning sophomore album, and an ambient arctic opus which showcases his cinematic sound that is rich in ethereal beauty and imagery.